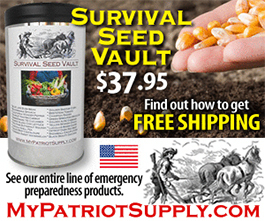 When it comes to being prepared for disaster, you have to really plan for anything. Our modern world has come to assume that governmental aid will come to our rescue if something goes wrong. We have been led to believe that in an emergency someone will come to help us. It has been proven that this isn’t the case and we can’t depend on help showing up. The reality is that the only one you can depend on, is you. A bug out bag is, literally, a bag of the essentials that you could grab and go if there is an emergency situation. Depending on the size of your family you might need more or less in your bag or more than one bag. The best place to start with putting together a bug out bag is to prep for a 72 hour emergency situation and then go from there. 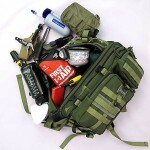 Keep in mind with a bug out bag you need to be able to carry what you pack. The more you take the more comfortable you will be, but the slower you will be able to move. Only you can determine what is essential for you. Tent – If you are unable to stay in your home or need to get out of an urban area a tent is a simple portable storage. Blankets/Sleeping Bags – Your best choice is Mylar blankets because they are light weight and keep in heat, but light wool blankets or sleeping bags also are good choices. First Aid Kit – A portable first aid kit is best. You will need a variety of items like; alcohol, medication, anti-bacterial creams, bandages, ibuprofen, aspirin, splints, and more. The size of the kit you get should be enough for the size of your family. Water Filtration – If clean water is an issue you will need to make sure any water you collect is clean. A filtration system could be in the form of canisters, tablets, charcoal, and more. Cooking Supplies – You should have a set of small lightweight cooking supplies. You can find sets where a pot, pan, and eating dish are all included in one set that can be carried together. Fishing Supplies – If food is an issue you can attempt fishing as a way to increase your food choices. Food – You will need a minimum amount of food for each person in your group. Lighters/Fire Starters – You will want to have several fire starting devices, including lighter and a magnesium strip with flint. Flashlights – Each person in your group should have their own flashlight and extra batteries. Multi-Tool – These are light weight and can serve a wide variety of functions. Fold Up Shovel – This lightweight item can be used for a wide variety of needs. Some tri-fold shovels come with an axe attachment, which is also a good idea. Duct Tape – This is another type of multi-tool that can help with a wide variety of needs. Radio Scanner – A small and portable radio scanner can give you information on what is happening around you.